…Happy 50th birthday Dr Who, long may you continue to fuel imaginations! Posted on November 23, 2013, in Uncategorized and tagged Children, Dr Who, Drawing, Family, Humour, Illustration, Life, Pen and Ink, Sketchbook. Bookmark the permalink. 8 Comments. I’m not a Whovian, but I’ve seen a few episodes and they scare the pants off me too!! I’m thrilled that my kids enjoy the programme as much as I did as a kid. Hands over the eyes, fingers in the ears! My son was 1 when the first Dr Who was broadcast.and he his behind the sofa too. It seems like yesterday! Your family, ( including pets), are so brave- nobody’s hiding behind the sofa! ( Glad to see that Evie has a cushion ready, and Gruff is doing that “I don’t want to watch, but I don’t want to miss anything” fingers in front of his eyes, routine. )I am 54, and just hearing the first 2 bars of the Dr Who tune still makes me terrified. I once managed to watch 5 minutes of a show, but I was grown up by then, and never repeated it! 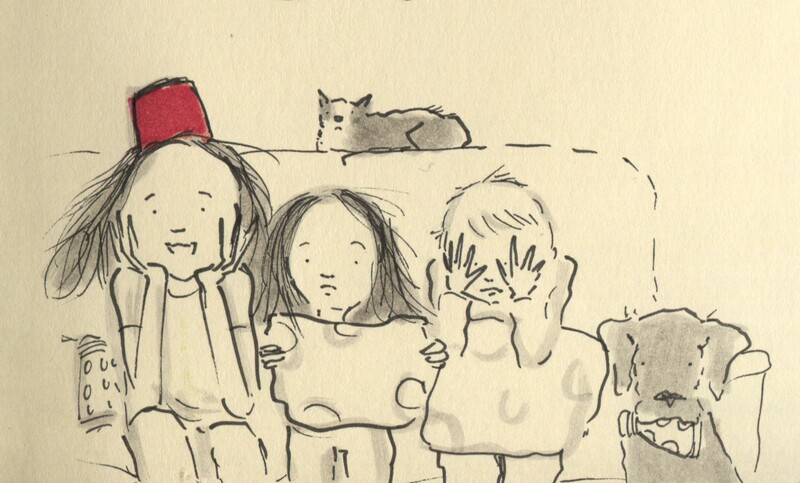 I love Millie’s Tommy Cooper fez…… just like that!